Last night we had a great party to celebrate John’s birthday. There were 18 of us gathered to eat sockeye salmon (barbecued with preserved lemons), boeuf bourguignon, and hazelnut chocolate torte; after dinner we were treated to another kind of feast: a performance of our friend Jeffrey Renn’s Poetry Night in Canada. When I finally fell into my bed around 1 a.m., I was completely sated — poetry, fine wine, good food, and the warmth of friendship. Earlier in the day, John, our lovely daughter Angelica, and I walked over to see the spawning coho salmon in Haskins Creek. Readers of this blog might think, “O no, here she goes again. The salmon…” But honestly it’s something I look forward to every year: the cycles of birth and death, darkness and light, the beautiful bodies of the fish in cold water and then dragged to the shore to feed the hungry appetites. The music is ravens klooking in the big trees and mergansers muttering in the quiet lake. 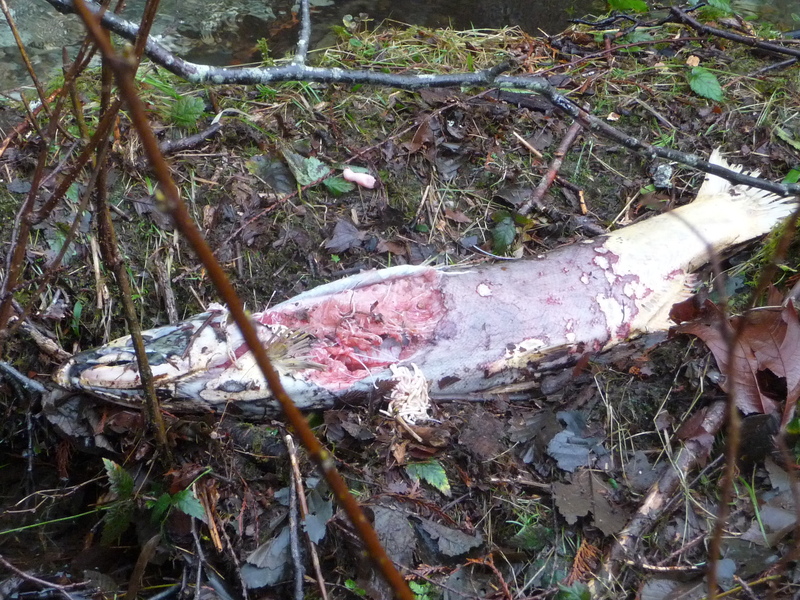 When I put the salmon on the white platter, I remembered the carcass on the banks of Haskins Creek, partially eaten. water my body can endure. ~ by theresakishkan on December 21, 2014. I think he had an excellent birthday, Andrea. I’ll pass along your wishes. And Happy Christmas to all of you. memories. Thank you for sharing it with us, Theresa. Red wine helps with just about everything. I’m looking forward to the time we sip a glass or two together. Merry Christmas and a wondrous 2015 to you. Yes, and isn’t it a bonus that it tastes good too? Cheers! This entry was posted on December 21, 2014 at 2:51 am and is filed under Uncategorized.You can follow any responses to this entry through the RSS 2.0 feed.You can leave a response, or trackback from your own site.